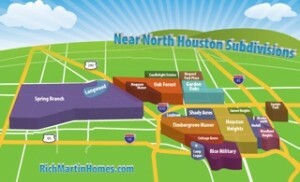 Everyone knows that Houston’s economy is booming and the real estate market is crazy. What is being noticed now however, is the fact that the sales of luxury homes (homes priced at a million dollars or more) has gone up considerably too. Our neighborhood paper, The Leader, reported on 12/28 that the area’s priciest homes are nearing $2 million dollars. $2 million! The Chronicle wrote yesterday that Houston has a Wealth of Million Dollar Homes. 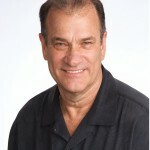 Martha Turner Properties, a local real estate firm known for marketing high end homes was just acquired by Sotheby’s. All of these point to an amazing market in high-end, luxury homes. 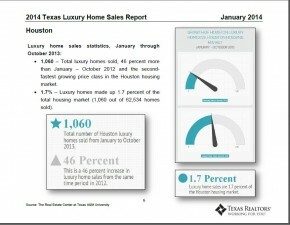 The best data for high end homes comes from the Real Estate Center at Texas A&M University. 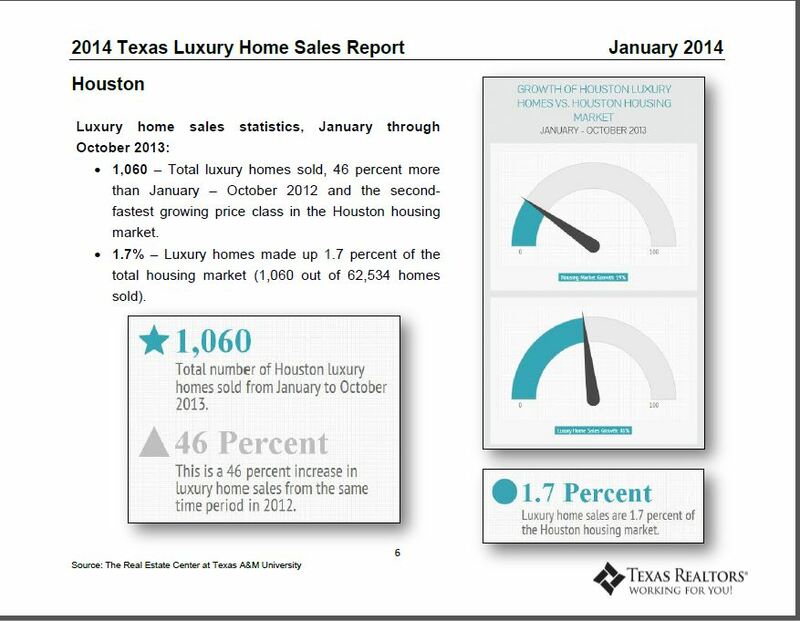 Their 2014 Texas Luxury Home Sales Report shows Austin to be the market leader in luxury homes. It’s sales of million dollar homes (for Jan-Oct) was up by 55% from the previous year. 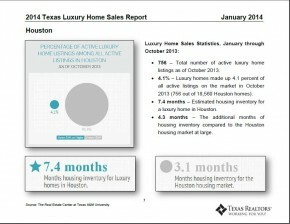 A summary of the Houston Reports are shown in the images. Houston was a close second however. Its sales of million dollar homes was up 46% over the same period last year. This is more than twice the rate of increase of the overall market at 19%. 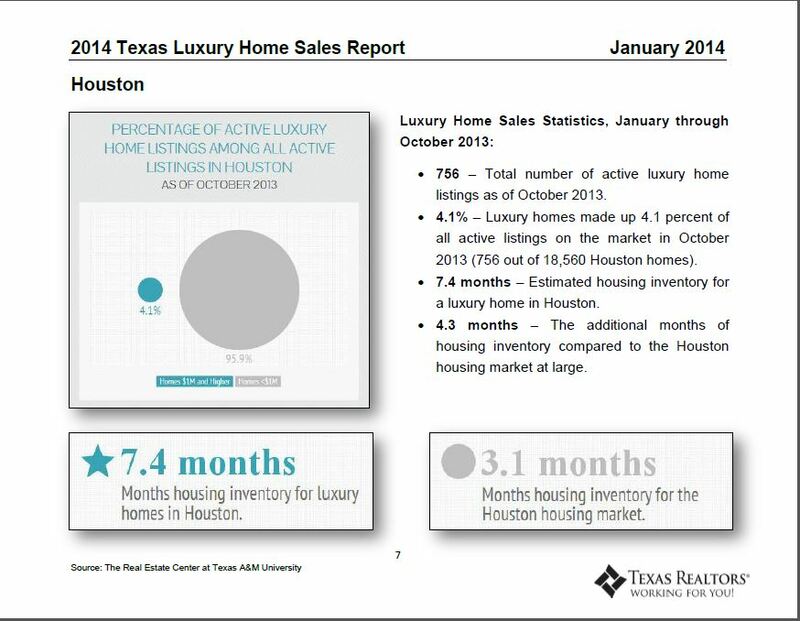 The housing inventory for luxury homes was 7.4 months in Houston, compared to 3.1 month inventory of all homes. 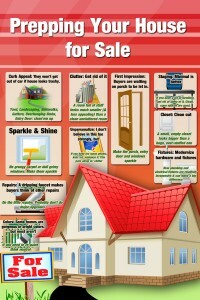 It’s logical that sales of million dollar home wouldn’t be as brisk as the overall market. The attached pdf shows the current inventory of Million Dollar HomesThere is one in Oak Forest, one in Clark Pines (a tiny area west of the Heights, between Timbergrove Manor and Shady Acres) and one in no-man’s-land of Pinemont Drive (a 7300 SF house on almost 2 acres for $1.5M). 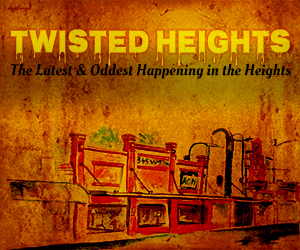 The other 17 are all in the Heights. 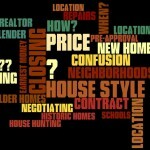 This MLS Search link will take you to current inventory of Area 9 luxury homes. I am marketing two of these homes: 1845 Harvard, a renovated 1914 Mediterranean Revival home priced at $1,245,000 and the new construction next to it at 1843 Harvard, priced at $1,302,000. Both of these luxury homes are the masterpieces of HDT Builders.